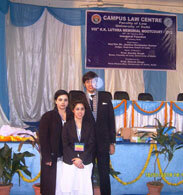 PCL Mooting Team consisting of Rida Aslam Bhatti, Zeeshaan Zafar Hashmi and Mehak Zarak Bari participated in the K. K. Luthra Moot Court Competition 2012 conducted by Delhi University. The team members were the sole participants from Pakistan and achieved 3rd overall position out of 62 participating teams from around the world including Cambridge and George Washington University. The team also participated in an Advocacy workshop conducted by George Washington University. The efforts of the team were highly appreciated by the judges as well the conductors of the competition.